LaZoom Bus is now offering an Art Tour of Asheville! LaZoom Asheville Art Tour is a first-of-its-kind art tour of Asheville, beginning Saturday, May 21, and running every Saturday at 11:00 a.m. from the French Broad Food Co-Op. The entertaining, non-comedic tours explore the neighborhoods and studios of numerous working artists, including Downtown, the River Arts District and West Asheville, while learning about the Asheville art scene, from local artist Gabriel Shaffer. 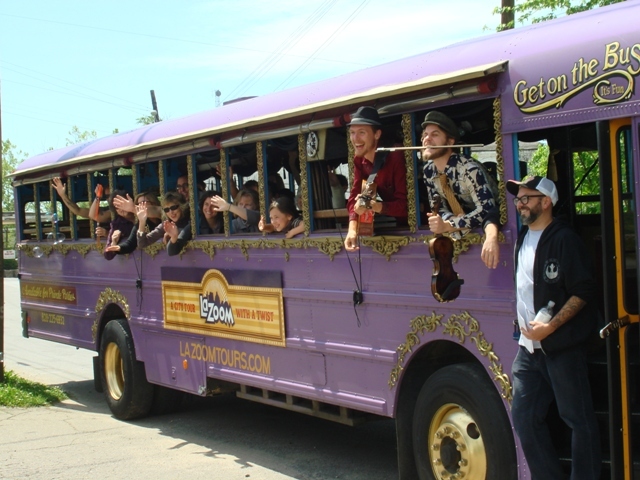 The LaZoom Asheville Art Tours include a musical act and will explore the neighborhoods and studios of numerous working visual artists, including artists working downtown, in the River Arts District and in West Asheville, while providing insight into the local creative history. Confirmed participating artists: Ben Betsalel, Julie Armbruster, Heather Knight, Moni Hill, ClaySpace Co-Op, Sean “Jinx” Pace, Melissa Terezza, Alena Hennessy, Dustin Spagnola and more. The tour will cover a broad scale of genres, mediums and locations to demonstrate the diverse creative landscape. Customers will walk away from the tour with a glimpse into the process of art-making and a better understanding of the Asheville art community. Tickets for the Art Tours will typically be $35 each, but for the months of May and June, LaZoom is running a special of $28 per ticket ($15 for kids). Tell your friends!! This tour is a one-of-a-kind glimpse into the Asheville Art Scene through the voices and work of local artists. It’s truly a wonderful and educational experience. City tours with a twist! 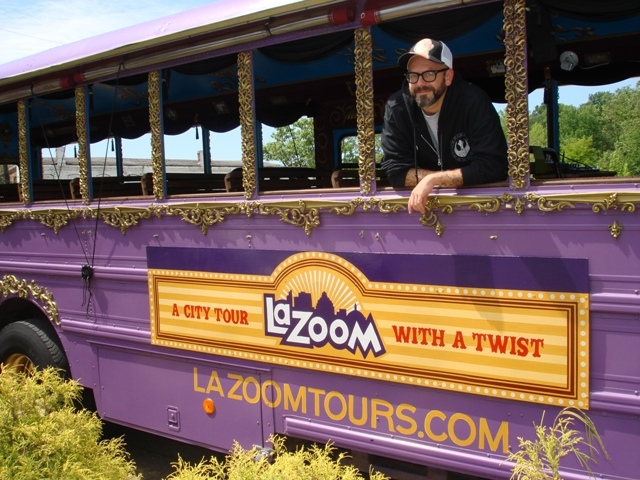 LaZoom’s iconic purple bus takes visitors and locals to the funny side of Asheville on their city-wide afternoon and evening Comedy Tours – historical and hysterical! Night-time, adult-only Haunted Comedy Tours take you to the campy, scary sections of town! 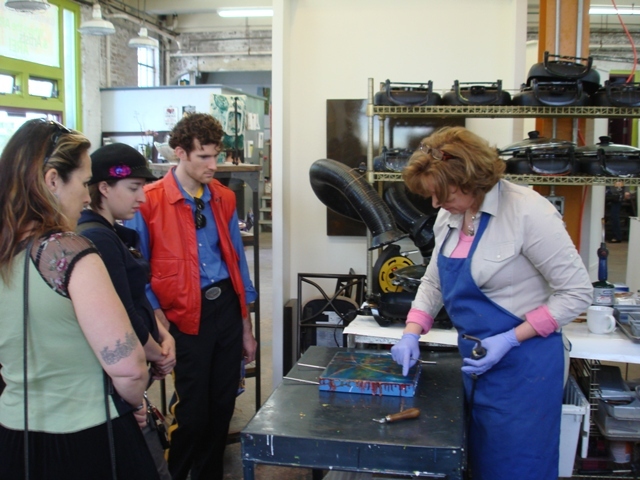 Or get on board the Asheville Art Tours where a real live artist guides you through the River Arts District, downtown and West Asheville arts communities showcasing art-makers in their studios. Artist Gabriel Schaffer, lives and works in Asheville, NC. He is the son of renowned folk/visionary artist Cher Shaffer and has an extensive background in writing and music, performing at such notable events as South By Southwest, Austin, TX and Around The Coyote Festival, Chicago, IL. Gabriel has exhibited his visual artwork across the country and sold hundreds of works throughout various major cities nationally and internationally.